A system of man-made caves carved into the sandstone beneath the city of Nottingham has been developed into a modern, award-winning attraction known as The City of Caves. 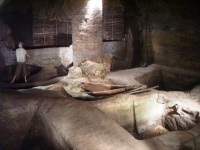 Anglo-Saxons originally inhabited the caves, and their lifestyle is depicted in dramatic presentations for visitors who come to explore Nottingham's 'underworld'. Over the centuries, the caves have been put to various uses by the locals, and were saved by protestors when developers planned to build a modern shopping centre over the top of them. Now guided tours take visitors through the caves and through the ages, from the mystical 'Enchanted Well', through a working medieval tannery, to the Victorian slum of Drury Hill and a World War II bomb shelter. Please note that The City of Caves is not wheelchair accessible.